The Mummers will be part of Revels Spring Sing in Watertown. 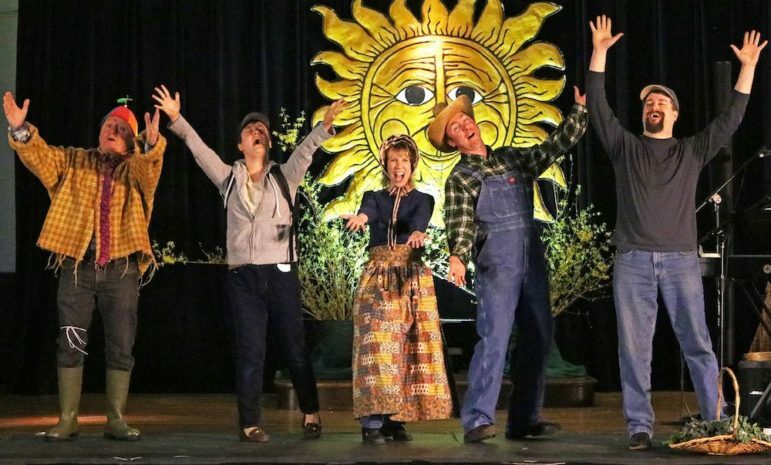 The annual Revels Spring Sing will be a Family Celebration of the Vernal Equinox. The annual event will be on Saturday, March 23, 2019 from 2 to 4 p.m. at the Belmont-Watertown United Methodist Church, 80 Mt. Auburn St. in Watertown. Wave goodbye to winter surrounded by budding forsythia and sprigs of green atthis joyful family celebration of spring filled with music, songs,mummingand more! Join us for a joyful celebration of spring filled with music, songs and mumming fit for the season! Led by Revelsmusic director Megan Henderson and former Revels music director George Emlen, we’ll whisk winter away with an eclectic mix of traditional songs, music and more from England, Ireland, and America. There’ll be lots of communal singing (song sheets will be provided!). Enjoy sing-alongs withChristmasRevelssong leader David Coffin, theRevelsYouth Alumni Chorusand guest soloistsJamie Jaffe, Louise Grasmere and Ben Horsburgh,a seriously funnyMummers Play, delicious refreshmentsplus a visit from that ancient and mysterious harbinger of spring, thePadstow ‘obby ‘oss, all the way from Cornwall, England! Come sing with us as we celebrate the greening of another year! Cookies and ciderwill be served. Belmont-Watertown UMC is wheelchair accessible. Doors open at 1:30 p.m.